We have a bird feeder behind our house that regularly attracts about a dozen different species of birds. Most return to our feeder daily and all year round, like the American Goldfinches, House Finches, Cardinals, Chickadees, Tufted Titmouse, Doves, Nuthatches, Carolina Wrens, Starlings, Bluejays, Red-bellied Woodpeckers, Downy Woodpeckers, Dark-eyes Junkos, and Sparrows. We also have several species that are here only seasonally, like Grackles, Catbirds, and Bluebirds. That’s the ones that immediately come to mind. There are probably a few more. Our neighborhood is a designated bird sanctuary, and the birds apparently know it. Bluebirds come to our feeder all year except during the summer, when there is plenty of other food to eat, like bugs. But during late fall, winter and early spring, Bluebirds frequent our feeder. Today, the Bluebirds returned. When I arrived home, there were six of them “working” the feeder as the sun was setting. I managed to get my camera set up and on a tripod in time to get off one good shot of one of the Bluebirds. Its blue and orange feathers were glowing in the setting sunlight with the fall colored trees illuminated in the background. It was a beautiful sight. Seeing the Bluebirds and capturing this one digitally made a good day even better. The above photo was taken with a Nikon D300 at ISO 200, 400mm, f/5.6, and 1/100 sec. 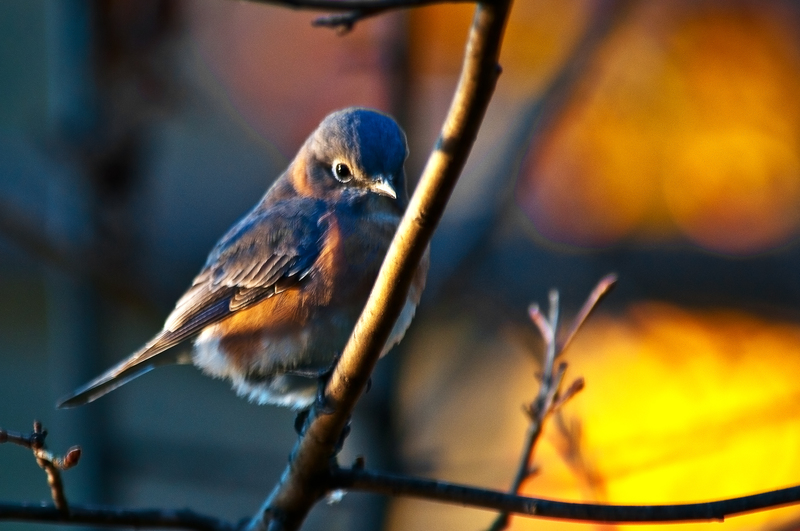 This entry was posted in Bird Photographs and tagged bluebird. Bookmark the permalink. I think we have all the same birds but you see them much more frequently than I do. I’m so excited when I can spot a woodpecker and I saw my first hummingbird in late August! But, alas, I have yet to see a bluebird. Your photo of the bluebird is gorgeous! Your photographs are intense, intriguing, and very inviting; the more you look the more you see and that’s what makes them so spectacular.. Total dedication to detail. Such comments are very inspirational.